Backyard farms, community gardens, parklands, rail trails and dozens of other creative repurposings of land are transforming our landscape. Many of these changes involve introducing agricultural activities where they had not existed for many years. In the past decade the number of community gardens in the US incereased from 6,000 to 18,000, and the trend is accelerating. But as more of us come to live in cities, or try to bring into production land that has had previous contaminating uses, we need to be more thoughtful about avoiding toxic chemicals, heavy metals, or other man-made problems in our soil. 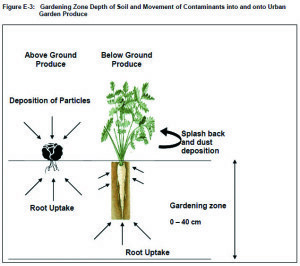 This issue is an attempt to survey the topic of Soil Remediation and report on groups that are in the trenches (literally, in some cases) dealing with contaminated ground and the current methods – in some cases physical barriers, in other cases planting in containers, some using plants to accumulate or microbes to detoxify contaminants, others applying humic substances to immobilize them – for making soil usable again. Those of us blessed with rural farm locations and healthy soils may not think twice about how fortunate we are to have such gifts. But even pristine environments now sometimes suffer spills and dumpings, so it behooves us to be aware of how easily healthy soil can turn toxic. Also, reading about how much time and effort is necessary to repair tainted land should make us all more grateful for the miracle of living, active soil that we can so easily take for granted. Some wise person once observed that the only thing standing between humanity and starvation is a few inches of biologically active topsoil. It is humbling to think that most of what we do as farmers and gardeners is tend forces that we don’t really understand, letting the knowledge bound up in seeds and soil sustain us. We hope that you enjoy this issue and it energizes your appreciation of these mundane miracles. Across the country, communities are adopting the use of urban agriculture and community gardens for neighborhood revitalization. 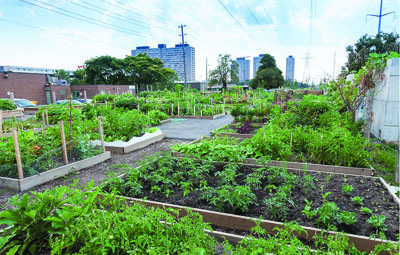 Sites ranging from former auto-manufacturers, industrial complexes, and whole neighborhoods, down to small individual lots, including commercial and residential areas, are being considered as potential spots for growing food. Redeveloping any potentially contaminated urban property (often referred to as brownfields), brings up questions about the site’s environmental history and the risks posed by a proposed reuse. At this time there are no definitive standards for soil contaminant levels that are safe for food production. 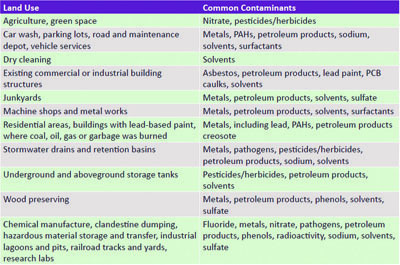 EPA has long-established soil screening levels for contaminated site cleanup, but these threshold-screening levels usually serve as a starting point for further property investigation and do not factor in plant uptake or bioavailability. 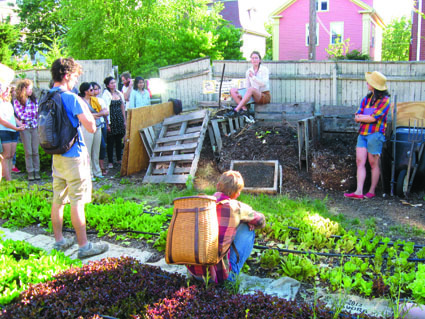 Urban gardening is gaining momentum in North America. Urban gardening can provide broad health, environmental, social and economic benefits. Often the land available for increasing the urban land base for community gardening are lands that are vacant, abandoned, or previously used for purposes other than food production. Despite a growing interest to garden on these lands, previous and current activities on or next to these sites might have resulted in con-tamination of the soil. This guide is a decision-support tool used to identify areas that may be contaminated but could be suitable for food production and to identify appropriate ex-posure reduction actions based on the condition of the site. We recommend testing the soil if the planned garden is on a Medium Concern site AND if the garden is larger than 13 X 13 ft. Testing the soil consists of tak-ing a soil sample, having it analyzed, and interpreting the results. It is not cost-effective to conduct soil testing for small gardens. This is based on estimates of the cost of soil testing versus building a raised bed garden. Collect a representative soil sample of the site. A composite soil sample is made up of two or more combined sub-samples to represent an area of the garden. 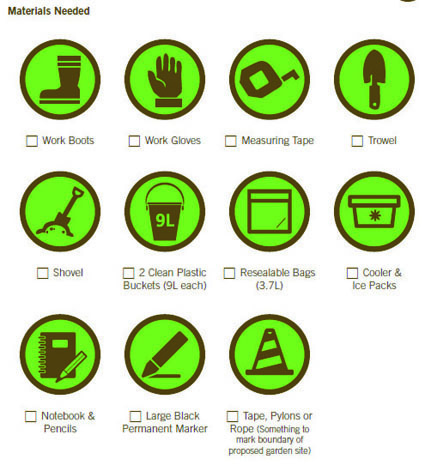 Use the following checklist to walk you through taking a soil sample. supply of salad and arugula through biointensive production and succession planting. Three young women turned their love of gardening into a thriving farm business. After college Fay Strongin, and sisters Laura Brown-Lavoie and Tess Brown-Lavoie, did not seek desk jobs but instead decided to start farming on an abandoned lot just minutes from busy downtown Providence, in Rhode Island. The future farmers searched every side street in ever-increasing circles, seeking an open lot. They researched lot ownerships at city hall and reached out to landowners. “It took a lot of detective work and repeated efforts to connect with the owner of the abandoned lot on Harrison Street that became Sidewalk Ends Farm,” Tess said. The three sought a written multiyear lease, but faced communication challenges with the landowner. The farm team eventually secured verbal permission from the lot owner to farm the land for a year. Harrison Street neighbors said there had been a rundown house at number 47 until it was torn down in the 1970s. Invasive vines and brush had completely taken over the lot. As the team began clearing away the brush, they found building debris, concrete and rubble in the cellar hole. Like many abandoned lots, this one had become the neighborhood’s dumping ground. The farmers found bottles and broken glass near every fence line. Lead is a widespread problem in America’s urban areas. Years of driving with leaded gasoline, using lead paint on our houses, and running our water through pipes joined with lead solder have seriously contaminated our soils. Background concentrations of lead in agricultural soils average 10 parts per million. In urban soils, however, lead levels typically are much higher. The Centers for Disease Control estimate that some 21 million pre-1940s homes contain lead paint. When 125 inner city gardens were tested in Boston in 2000, 82% of them had lead levels above the reportable limit of 400 parts per million (ppm). We have banned leaded gas and lead in paint, but the element does not migrate easily nor is it taken up in plants or degraded by biological activity. 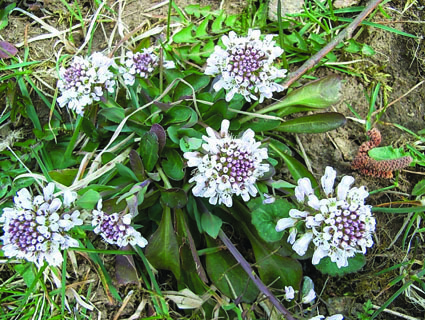 Thlaspi caerulescens, or alpine pennycress, is a small, weedy member of the broccoli and cabbage family. It accumulates metals in its shoots at astoundingly high levels. Phytoremediation is the use of green plants to remove pollutants from the environment or render them harmless. Current engineering-based technolo-gies used to clean up soils — like the removal of contaminated topsoil for storage in landfills — are very costly and dramatically disturb the landscape. But the “green” technology of using plants to take up heavy metals and radioisotopes can, in certain situations, provide a more economical approach and one that is less disruptive as well. Certain plant species — known as metal hyperaccumulators — have the ability to extract elements from the soil and concentrate them in the easily har-vested plant stems, shoots, and leaves. These plant tissues can be collected, reduced in volume, and stored for later use. In addition, of course, while acting as vacuum cleaners these unique plants must also be able to tolerate and survive high levels of heavy metals in soils — like zinc, cadmium, and nickel. Bioremediation is defined as the use of biological processes to degrade, break down, transform, and/or essentially remove contaminants or impairments of quality from soil and water. Bioremediation is a natural process which relies on bacteria, fungi, and plants to alter contaminants as these organisms carry out their normal life functions. Metabolic processes of these organisms are capable of using chemical contaminants as an energy source, rendering the contaminants harmless or at least making them less toxic. This paper summarizes the general processes of bioremediation within the soil environment, focusing on biodegradation of petroleum hydrocarbons. The effect of soil conditions on rate of biodegradation of hydrocarbons is addressed. Further, limitations and potential of both ex situ and in situ bioremediation as viable alternatives to conventional remediation are explained and addressed. Humic substances, a mixture of complex organic compounds that are usually separated into three fractions: humic acids, fulvic acids and humans, are generally seen as important components of soil and natural water. They are formed during humification of organic matter by soil microorganisms. Hu-mification is the chemical-microbiological process of transforming debris from living organisms into a general class of refractory organic compounds. Humic substances account for 50 to 80% of the organic carbon of soil, natural water, and bottom sediments. They are typically derived on an industrial scale from natural deposits like peat and coal. The beneficial results of wide spacing in grain crops are great indeed! Here in our own backyard, the Heritage Grain Conservancy conducted SARE-funded organic wheat trials at UMass and at partnering farms over four years from 2008 to 2012. Not only did we trial and select hundreds of almost-extinct landrace wheats for local adaptability, but we conducted spacing trials to compare the health and yield of landrace and modern wheats at various spacings. The fields were cover cropped the season before, enriched with minerals and under sown with clover to suppress weeds. Wheat seeds were spaced 12”, 10”, 8”, 6” and 4” apart in 3 replicated plots. After analysis of the results at the end of the season, we discovered that wider spacing produced higher yield and more robust plants with less disease, especially in the heritage wheat plots.